Interestingly, it’s the nanosuit-wearing hunters who must be most aggressive. While their objective is to kill all ten (fourteen on PC) of the CELL operatives, those operatives need merely survive for the duration of the match: two minutes, during which they accrue points at regular intervals for bare survival. The stringent time-limit and target-rich environment promotes a faster, more assertive form of predatory stealth over the typical cautious stalking that most other stealth action games favor. 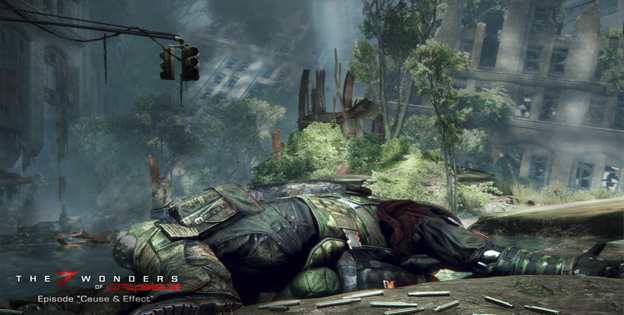 Through it all, Crysis 3 remains a gorgeous game. I’m not speaking merely of the engine, either, which is the same CryEngine 3 that made Crysis 2 so spectacular. It’s been fine-tuned, surely, but this is the same edition of the engine. 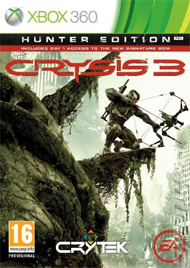 The most impressive visual element of Crysis 3, though, is the environmental design, which features a fluid mix of urban, industrial, and rainforest-like environs. The dam level that we were shown showcased this beautifully, with the concrete and steel of the dam and its various accoutrements contrasting, yet blending naturally, with the forest that Prophet zip-lines into after detonating charges he’s placed on the dam’s structural keystones. Will Prophet succeed in his quest for vengeance? Will Crysis 3 run on my computer? If it does, will I see you (or miss you, as it were) online, in Hunter mode? The answers to these questions and more are coming next month, when Crysis 3 hits shelves and non-Steam digital retailers.